Yes, Register Me For The SB 391 Campaign! Remember to come by our office to pick up your postcards. Legislation (the California Homes and Job Act - SB 391) to secure a permanent source of funding for housing affordable to low-income seniors, veterans, working families and the disabled faces crucial hurdles in the State Assembly and if passed, then with Governor Jerry Brown. We have just a few weeks to show legislators how important it is to their constituents to pass this bill. Join us for a 'postcard' campaign for SB 391. 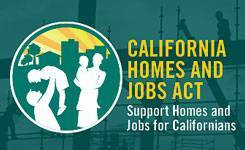 * How will SB 391 bring millions of dollars and thousands of jobs into your communities and provide thousands of beautiful, affordable, well-managed homes? * How can you make an important contribution to the passage of SB 391. In last year's push to pass SB 1220, many legislators mentioned how impactful the postcards had been - so we would like to learn from that postcard effort and expand it. Download the postcards instruction sheet here. Please tell us how many postcards you will need and come by our office at 501 Shatto Place, Suite 403. Los Angeles, CA to pick them up. We cannot mail them. They will also need to be returned to us - so we can send them with thousands of others to the Governor later this year. Postcard languages available in English, Spanish, Armenian, Chinese (Mandarin), Filipino (Tagalog), Korean, Persian (Farsi), Russian, Thai, and Vietnamese. We have a limited supply of postcards so please fill out your campaign registration as soon as possible. Questions? 213.480.1249.